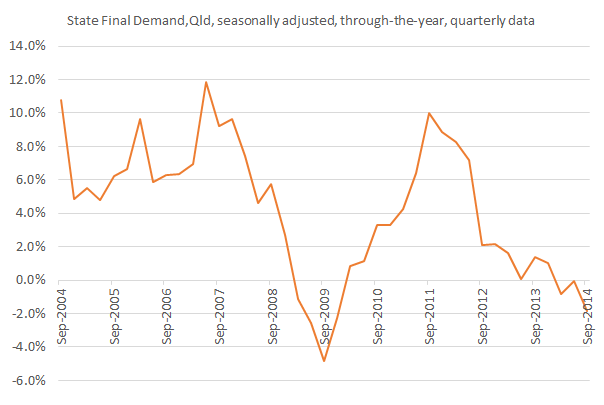 The first exports of LNG from Curtis Island off Gladstone are expected to occur later this month, and they can’t come soon enough for the Queensland economy, with our current economic weakness confirmed by State Final Demand estimates in yesterday’s National Accounts data (see chart below). The drop in State Final Demand (which doesn’t include exports) is due to the well-known drop off in heavy construction work associated with the resources sector. This is a big shock to our economy, and our successful recovery from it will depend a lot on how quickly LNG exports can boost economic growth and how much of the export earnings end up being retained in our economy. It’s unclear to me just how much Queensland will benefit at this stage. While there are jobs associated with the LNG exports, there are far fewer jobs than the jobs involved in the construction phase. And while the Queensland Government will capture some of the benefits via royalties (some $1/2 billion a year), large shares of the profits associated with the export of LNG are likely to flow overseas or interstate. So, even though Gross State Product will boom due to LNG exports in the next couple of years, the actual impact on employment and incomes of Queenslanders may be less exciting. This entry was posted in Macroeconomy, Mining and tagged abs, curtisisland, exports, gladstone, gsp, lng, qld, queensland, sfd. Bookmark the permalink. Gene a very good and (almost definitely) accurate read of the impact of LNG exports on the Queensland economy. Now that we can export the gas and Queensland’s prices will be dictated by world markets, any idea what is likely to happen to the domestic price of gas? I cannot imagine gas prices going down, so the pendulum of relative prices between coal fired power and gas will be swinging back towards coal. I think it is these subsequent impacts from the creation of a new export product that may have more of a bearing for the Queensland economy than the LNG industry itself (setting the royalties aside).